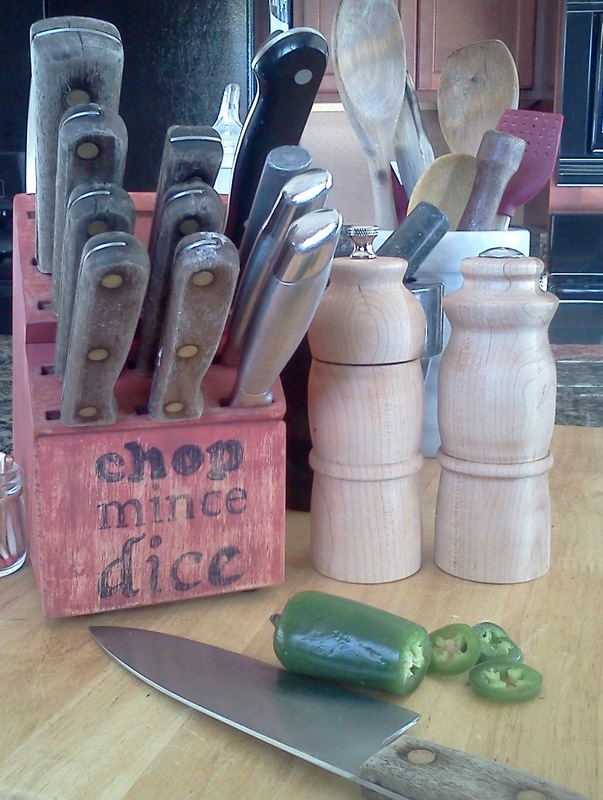 So, this sad, decrepit knife block got a little makeover today. Replacing my knife set is a must do at some point this year, but until then I thought it might be more appealing if it had a facelift. Out came the sandpaper, the paints, the printer, a sharpie and a little food safe wax. Tada! A new lease on life, however temporary. Fortunately, it took about 20 minutes and didn't cost a darned thing. I began by giving the whole thing a light sanding, wiped it off and gave it a quick coat of red. The one I had on hand happened to be a tomato red craft paint. It was dry in a matter of minutes. 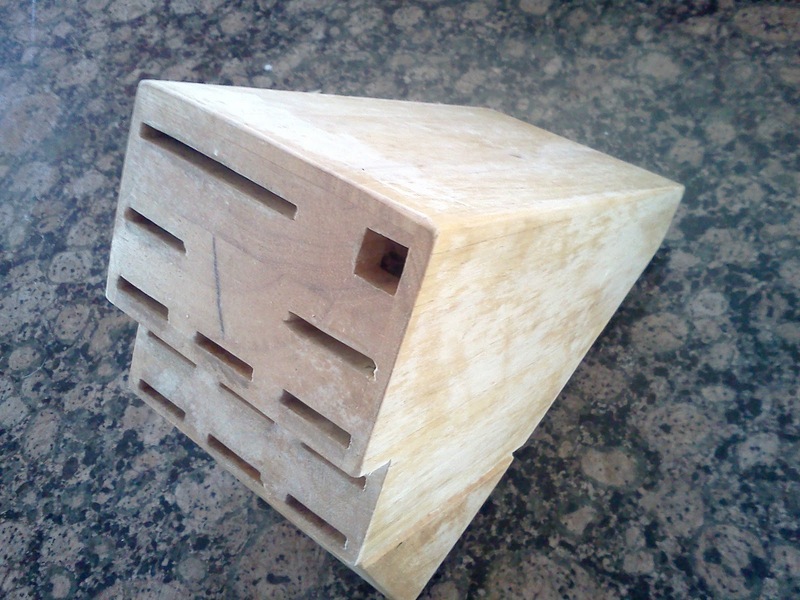 I roughed it up a bit, especially along the edges and where normal use would rub the finish away. Another quick wipe followed by a coat of watered down burnt umber craft paint. . 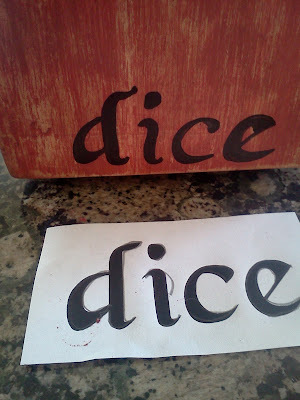 I grabbed the computer to create a little word art and let the paint set up. 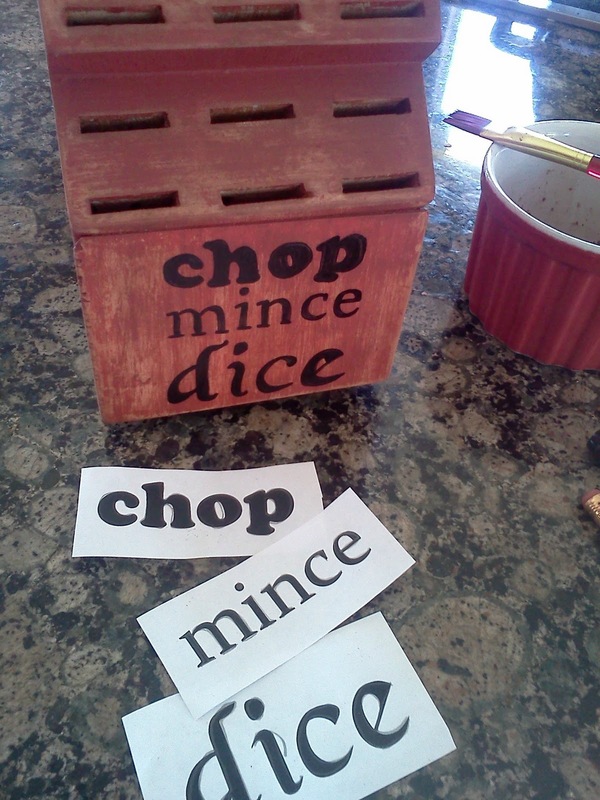 Dice, chop and mince were natural choices. 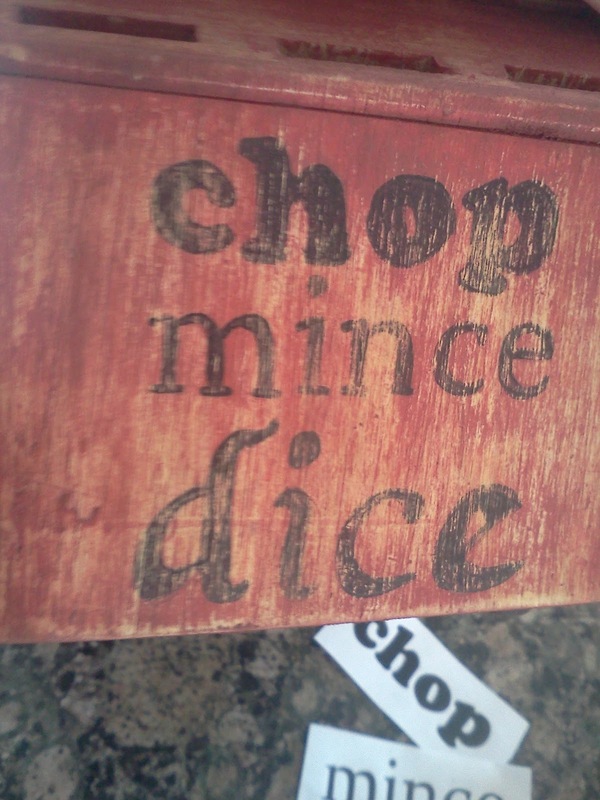 Captain Obvious is in the house! To transfer the words to the surface, I rubbed the back vigorously with a pencil, being sure to cover the letters completely. 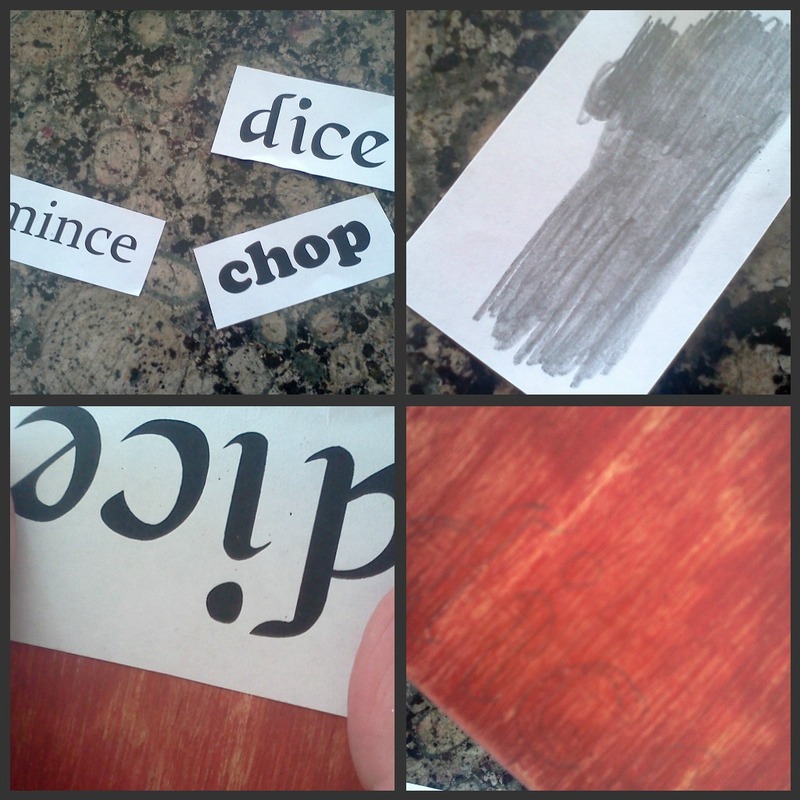 Then line that little piece of paper up where you want the word to appear and trace the edges of each letter. The bottom right pic shows how the pencil transferred. Its really light, but that's really all you need. I chose three different fonts, but sized them to be the same width. I wanted to keep the look old and weathered, so I sanded a bit of the black sharpie off, again concentrating on the areas that would normally be rubbed off with everyday use. Notice the top of chop isn't as sanded away? After wiping away the dust, I swiped another lite coat of the watered down burnt umber. After that had dried I rubbed the whole thing down with a little food safe wax that I had lying around just to protect it from various spills, wet hands and the inevitable splashes from the stove. And there you go, a mini makeover in the kitchen. This should hold e over until I replace the set entirely and retire this one to the camping gear. 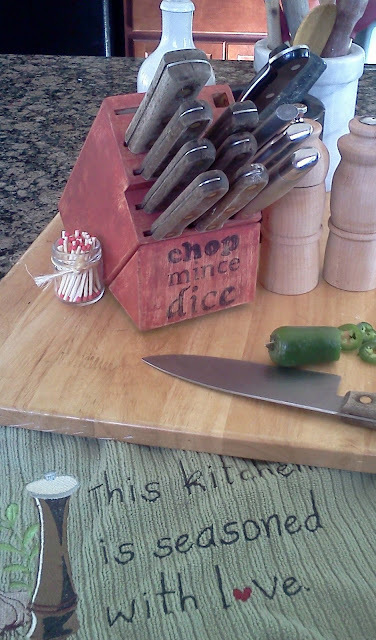 In case you were wondering, the towel was a handmade Christmas gift that came with the hand turned salt shaker and pepper grinder that share space on my cutting board. I love useful gifts, especially when somebody (or in this case two somebodies) take the time, energy and love to make me something that they know I will love. Love the way this turned out! So nice and definitely an upgrade to a boring old knife block.